Ok. Ok. Halloween is totally over, I know. But I still really want to share pictures of our Halloween decorations with you. We had a great time painting, taping, hanging and cutting. We re-used a lot of our decorations from last year and added a few new ones. Andy and I cut out a few fake moustaches using black poster board and wooden skewers from Target. This was so much fun!! We made the ‘staches together while watching Parks and Recreation — for Ron Swanson moustache inspiration! 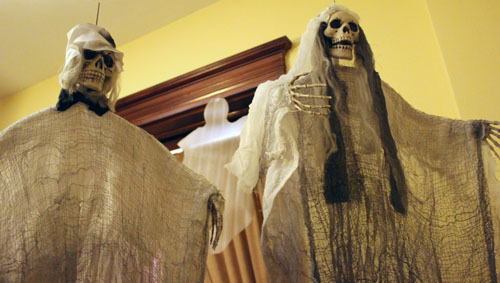 The skeleton bride and grooms were the only store-bought decorations I got this year, but I really like them. I bought them on clearance at Lillian Vernon for something like $5. Such a deal! 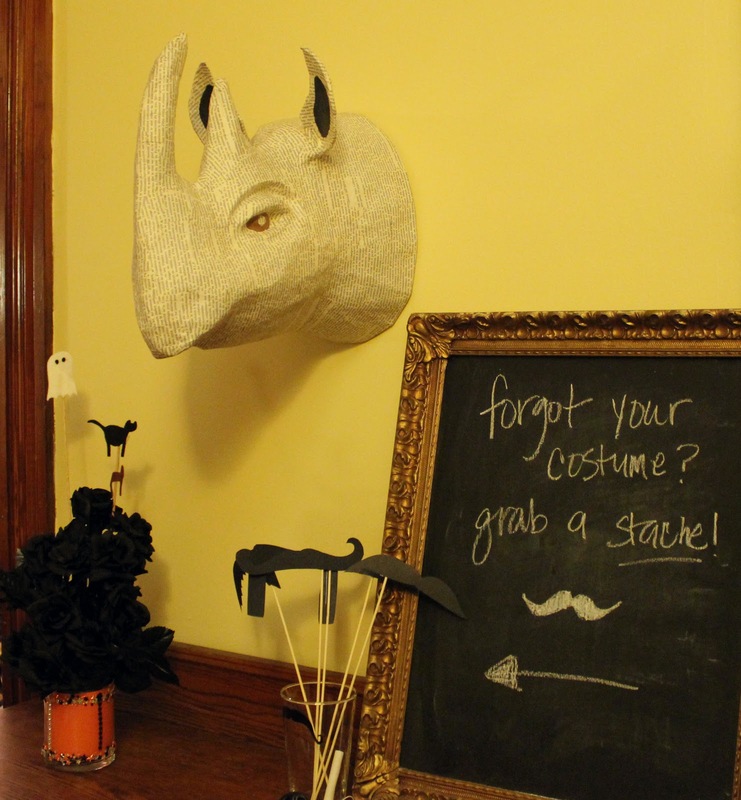 We hung them in our entryway to welcome party guests. To decorate the mantel, I wanted to go vintage creepy. I used a few things I had from last year: the black bushes and the framed portrait in the middle (she moves when you look at her from different angles). I added to that a bunch of antique black and white photos that I found in a box of my grandma’s things. The raven figurine is on the mantel all the time but is especially perfect for Halloween. The table was my favorite thing to put together. 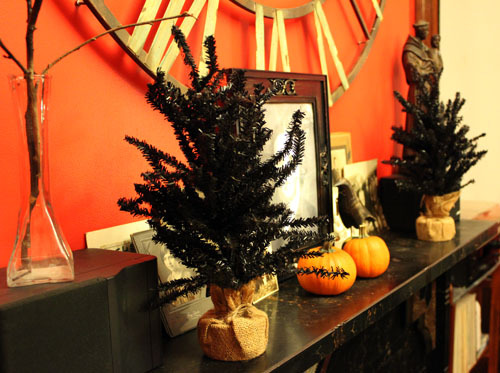 I spray painted about 10 mini pumpkins metallic black, as well as some wine bottles. I also collected some branches from the back yard and spray painted them black as well. 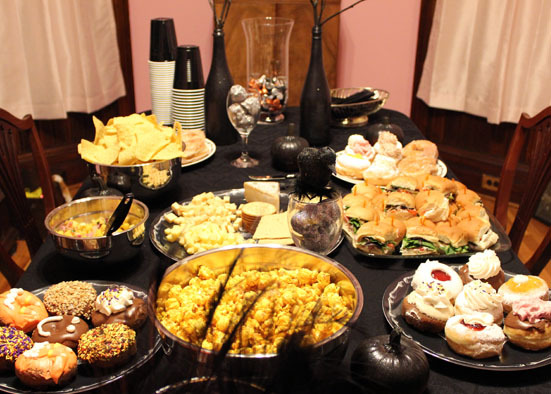 I filled wine glasses with glitter-covered skulls that I had already, and pulled apart last year’s feather wreath to fill a glass jar with black peacock feathers. A fantastic spread of food certainly helped, too! It really doesn’t have to cost a fortune or take a ton of time to decorate for any holiday or party. Think about what you have around the house already and what items can be grouped together thematically. Using items you already have, especially using them in new and different ways — like the vintage photos I found in my attic — will make your holiday decorations more personal and more fun for both you and your guests. And, a coat of spray paint can certainly come in handy!